Item Condition: Like new condition, little to no signs of wear. LCD great. Warranty: 90 day Vistek warranty. Accessories: User's manual, neck strap, charger, x2 batteries. Used item may not be exactly as shown. Check Used Details for more information. 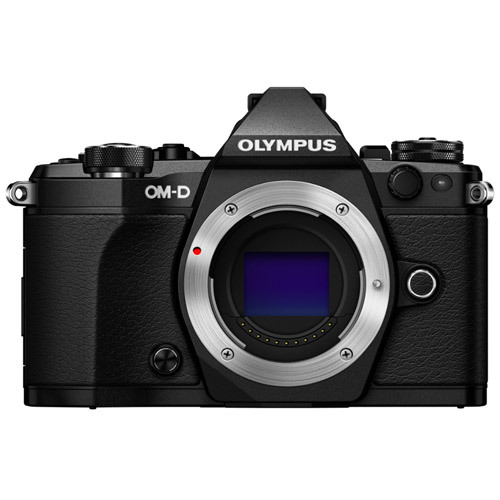 The new OM-D E-M5 Mark II features the most sophisticated image stabilization technology ever offered in an interchangeable lens camera. The ultra-sensitive 5-axis VCM (voice coil motor) system is so responsive and accurate, you can shoot sharp images in low light and capture silky smooth video, hand-held without a tripod. The E-M5 Mark II is also a bring-it-anywhere portable system camera that is nearly 40% lighter than conventional DSLR’s and its durable all metal body is sealed for splashproof, dustproof and freezeproof protection. Quite simply, the E-M5 Mark II is the world’s best interchangeable lens camera for “run and gun” spontaneous video shooting. With its unobtrusive size and 5-axis IS technology, the E-M5 Mark II lets you shoot hand-held and still capture cinema-quality movies. 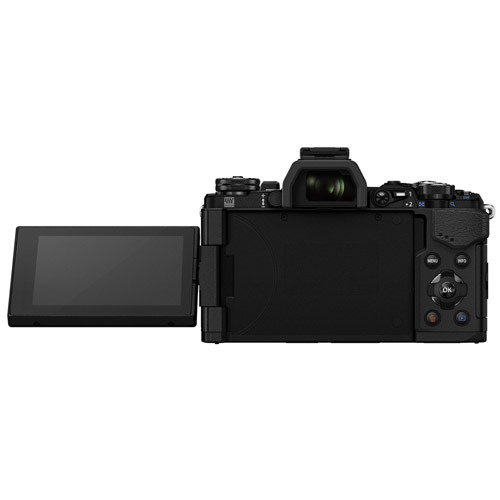 Pro-level features give you the flexibility to experiment, and an all-new robust touch screen interface allows for adjustments to AF point, exposure, aperture, shutter speed and more without interrupting recording. The E-M5 Mark II sits squarely in the sweet spot for the creative shooter who needs a portable system with all the power to realize their creative pursuits. High-speed sensor and image processor. Large interactive EVF. Touch and Swivel LCD monitor with convenient variable angle positioning. Lightening-fast autofocus with coverage of almost the full frame and Manual Focus options that nail everything from serious fast sports action to dramatic portraits. With the E-M5 Mark II, Olympus has once again raised the bar on image stabilization technology, with an industry-leading five steps of compensation - that's the most sophisticated image stabilization in the world!*. No matter how you move the camera – horizontal or vertical shift, pitch, yaw or roll – five-axis IS has you covered. And because the IS system is in the body of the camera, you’ll get blur-free results regardless of which lens you use. From the diamond textured dual control dials, to the 6 direct function buttons, the E-M5 Mark II is a highly accomplished ergonomic photographic tool. All external controls have been arranged for making quick changes to key settings on the fly second nature. Sealed for protection against moisture and dust, the E-M5 Mark II’s durable all metal construction body supports a full array of similarly “proofed” accessories, including the bundled FL-LM3 swivel bounce flash and an optional powered battery grip as well as eight* M.Zuiko Digital weather-sealed lenses. The camera’s shape and materials were specifically chosen to keep the body slim but easy to hold and shoot with all day. 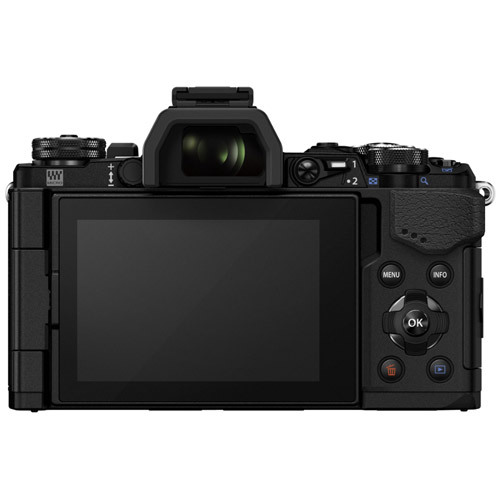 The high-speed 16 Megapixel Live MOS sensor/TruePic VII™ image processor combo that has won accolades from professional publications and websites is at the heart of the E-M5 Mark II’s imaging performance. 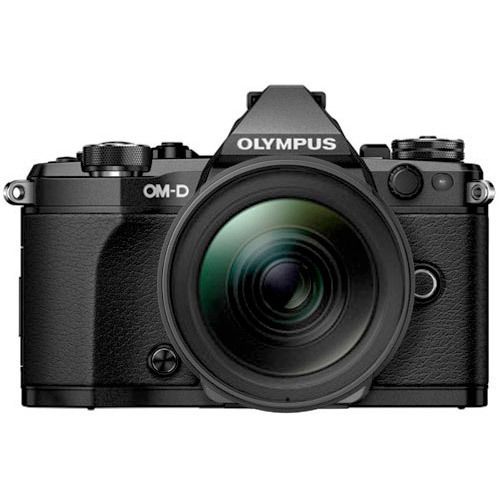 Also available: a 40 Megapixel high-resolution shooting option for landscapes and studio shots that require the maximum possible detail; 10fps burst shooting; a blazing fast maximum shutter speed of 1/8000 sec. ; and a high-performance electronic first curtain and a purely electronic shutter for totally silent shooting. Forget about obtrusive rigs that make shooting movies a production. The E-M5 Mark II’s compact size and 5-axis image stabilization make it the world’s best interchangeable lens camera for hand-held video. Pro-level features include high bit rate recording, variable frame rate and focus peaking while filming, and the Movie & Still Compatible lens drive mechanism, or MSC, found in M.Zuiko lenses eliminates auto focus sound for fast, smooth and silent autofocus operation while filming. You want pro features? The E-M5 Mark II’s got ‘em. 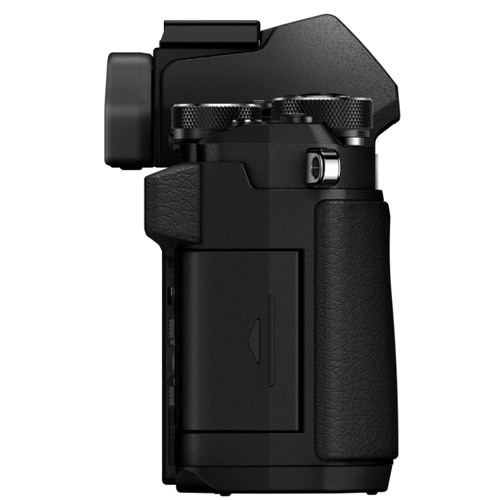 Interactive, high-resolution and high magnificationelectronic viewfinder. Three-inch touch-screen LCD monitor, with variable angle positioning. Built-in WiFi for instant connectivity. Live Composite, which automatically blends multiple exposures for incredibly detailed night scenes. 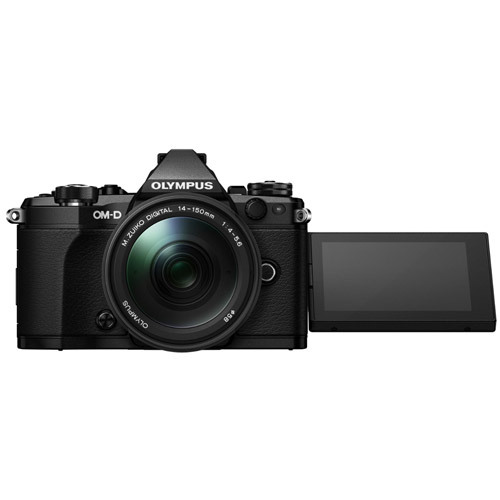 And compatibility with Olympus Capture camera control software, which creates a seamless interface between camera and computer for studio work. ?ISO sensitivity is fixed at 200, and maximum shutter speed setting is 4 sec. ?Exposure compensation can be performed. 2 programmable settings, preview capability. HLD-8 Power Battery Holder separately available. Allows attachment of an additional BLN-1. AC-3 AC adapter* separately available. *HLD-8 Power Battery Holder is required for connection.